ComfortableStyle boasts all the professional quality reports you need, for both print and email. With a ComfortableStyle Installation report you can give the fitters the correct information they need when fitting your products (i.e. a worksheet). This report can show the job which has been edited for survey sizes and notes letting the fitter know exactly what goes where and what the customer is expecting to be done. The fitters will look professional using the Installation reports. They even feature satisfaction notes for reporting any non-conformance on the installation. ComfortableStyle 'Invoice' reports can be printed at any time showing a list of exactly what is on the job, eliminating the need for someone to type an invoice before acquiring payment. No more delays because the customer needs more detail. Invoice reports can be re-printed (or re-sent via email) at any time to show the customer what they have already paid, and more importantly the outstanding balance! ComfortableStyle, helping you to grab the sale! 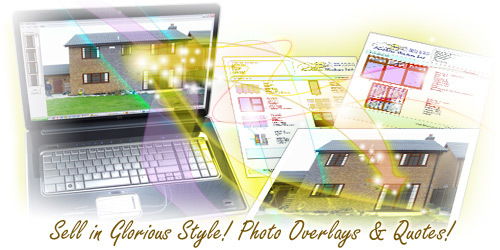 With professional prints and photo overlay! Any item can be super-imposed on to a digital photograph of the customers house, empowering you to show the customer how their new purchase(s) can look on their property. This can also aid the customer in choosing the designs that they need, if they are as of yet undecided. Colour, Stained Glass and Georgian Bar options can also be shown. Using ComfortableStyle to run your business can make you more efficient, more profitable and Stylish! ComfortableStyle is the opportunity to improve your business now at a cost you will recover on the first reasonable job you sell. What have you got to lose? Probably just a lot of the work you have to do without it, and surely that is something you would just love to lose! ComfortableStyle boasts an extremely easy to use custom style designer. The style designer enables you to add your own window and door styles to the system with ease, using a graphical interface that allows you to quickly create new styles. ComfortableConservatories users will already be familiar with the designer as it is virtually the same as the one included in that software package. ComfortableStyle also stores customers details for future use. The invaluable option lets you store your customers detail, so that if they order from you in the future, you can pull up their address information, without wasting the time to key in the information again and again. To find out more please click the next button, for ComfortableStyle for windows, doors and more.